I love pickled veggies, and have a bounty of colorful cherry tomatoes from our veggie garden. Traditionally, pickling involves sweltering over a steaming water bath in the kitchen during a heat wave to seal the jars. Ugh! But for these quick pickles, no sealing of jars is needed. Simply fill and set on the counter for a day or two; eat and enjoy! They couldn’t be easier. I have two recipes for you here, one is a classic dill pickle, and the other has an innovative herbed flavor from Philly restauranteur Jose Garces. Both recipes are delicious crowd pleasers. Before we grew our own, we sourced beautiful, flavorful cherry tomatoes from our local farmers’ market. I always love going for tomatoes of different shapes, sizes and colors for a gorgeous presentation. They’re packed in glass jars, but since the jars don’t need to be sealed, you could easily use a different container if you don’t have Mason jars. This is a classic dill pickle flavor, perfect for summer. Serve these at your Labor Day grill party, and watch them disappear! Pour vinegar and 3/4 cup water into small saucepan. Add salt, sugar, and lemon peel. Bring to boil, stirring to dissolve sugar and salt. Remove from heat. Let cool 20 minutes. Pierce each tomato 2 times with a 4-pronged fork. Toss tomatoes, dill, garlic, and crushed red pepper in large bowl. Pack tomatoes into glass jars, and pour cooled vinegar mixture over. This is a sweeter, spiced pickle. The rice wine vinegar and seeds play off each other well. Pierce each tomato 2 times with a 4-pronged fork. Combine all ingredients (except tomatoes) in a medium saucepan and bring to a boil. Once it boils, remove from heat and let steep for 20 minutes. Then pour cooled pickling liquid over tomatoes in a (preferably) glass jar. Let stand room temperature for 4-8 hours. These keep in the fridge for a few days. At Jose Garces’ Whiskey Village restaurant, these pickles are served alongside crusty baguette, goat cheese and olive tapenade. Go for it! 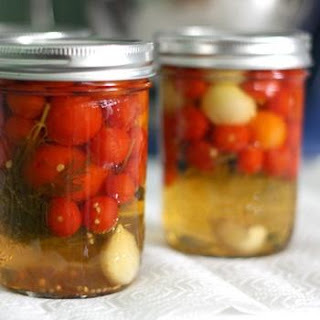 Do you have any other pickled cherry tomato recipes? Leave them in the comments; I’d love to try a new one.